Awesome Friday! 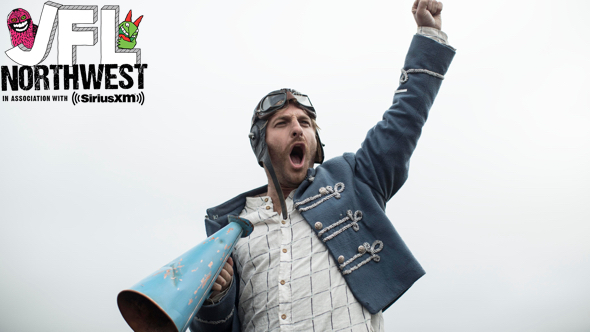 » Blog Archive Vancouver Just For Laughs Film Festival: 'Pork Pie' is a fun romp through the country - Awesome Friday! Jon is joined on his road trip of self discovery by two other characters: Luke, the expert driver who is on the run from a gang of thugs, and Keira, an animal rights activist whom they pick up as she’s being fired from her job at a fast food joint basically because she’s an animal rights activist but also because she’s terrible to every customer. Maybe more the latter. It’s Jon’s movie though, and Dean O’Gorman (of The Hobbit Trilogy) plays him with just enough charisma to be believable that he’s ended up on this adventure, but also just enough self loathing that when you find out how and why he didn’t just screw up, but screwed things up, it all makes sense. This is another movie that bounces between a few genres, a comedy, a car chase, and a story of a man at least starting to own who he is, and while the front half and the back half of the story feel pretty different, the balance mostly works. I can’t lie though, there are some choices toward the end that I’m not fully on board with, mainly in that the movie seems to want to absolve Jon in a way that I’m not sure he really earns through the story, but O’Gorman is so charming that even in those moments he sells it. The movie begins and ends with a car on fire, each one an apt visual metaphor for Jon’s place in life. The story that gets him from the first fire to the last one doesn’t bring a whole lot of new stuff to the table but O’Gorman is great, the rest of the cast are having fun, and you get to see a ton of gorgeous New Zealand landscapes. It’s a fine way to spend your time.